It's only been a few months since La Mexicana Grocery expanded into the space next door to provide a place to sit down and eat their food. You could enter through the restaurant door, but then you would miss all the sights and smells of the market. Plus you wouldn't pass the window to the kitchen where they are making the food, or see the simmering pot of menudo. You might even notice the two large vessels that contain their house-made beverages. Last time I was there it was a pineapple agua fresca and a classic horchata. Their horchata ($1.50) was sweet, light and clean with a dusting of sweet spices on the top. It's a great way to cut the fat and heat of a taco snack. 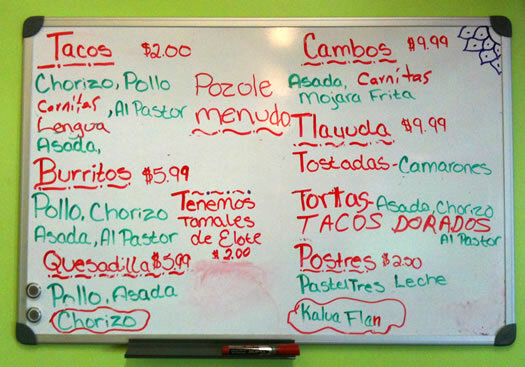 Speaking of tacos, the menu board lists chorizo, pollo, carnitas, al pastor, lengua, asada. For those without a working knowledge of Spanish food, that roughly translates to sausage, chicken, pork, spiced pork, tongue and grilled beef. 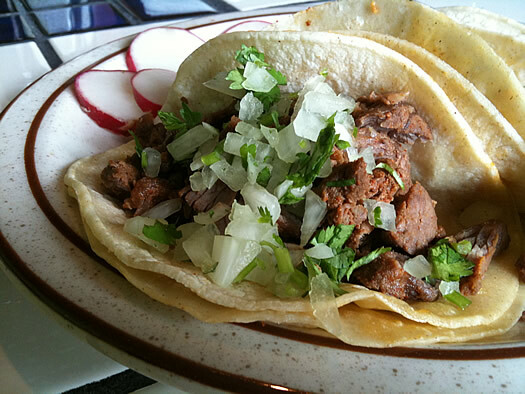 I still have yet to try the lengua, but try it I shall. Here's how they stack up, from the bottom to the top. #5 Asada: I like mine beefy, juicy, charred and free of gristle. This didn't deliver. #4 Al Pastor: If I hadn't had good Al Pastor in the past year, this might have been fine, but it lacked a certain depth of flavor I associate with the best versions of the filling. #3 Pollo: This was good. It was well seasoned and tender. #2 Chorizo: I love fatty sausage, and this tender, spiced ground meat was a highlight. #1 Carnitas: A squeeze of lime, on rich, fatty tender chunks of pork shoulder, sandwiched between warm corn tortillas, and splashed with a zesty tomatillo-based salsa verde is what tacos are all about. The raw onions bring a bit of texture and cilantro brightens it up. Ideally, I'd prefer my carnitas a bit crustier and fried in lard*, but never did I expect to find a satisfying carnitas taco in the area. And I've kissed a lot of frogs. I'm even willing to overlook the absence of pickled carrots and peppers. Now I'm looking forward to even more visits so I can try everything on their menu. Here's my short list. + Tamales de Elote are a plain corn tamale and a traditional breakfast food. + Tlayuda have been described as a Mexican pizza, and I'm more curious than anything. + Tacos Dorados are tortillas stuffed with meat and then deep-fried for a crispy exterior. + Tres Leches takes cake and soaks it in sweetened condensed milk. 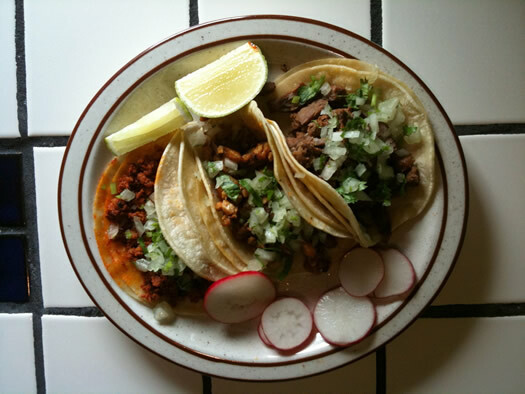 There are no two ways about it, the Capital Region actually has a bona fide taqueria. I have no idea where our Mexican population is coming from, or what is bringing them up to our area, but I couldn't be more excited. Now when I get off the plane in Oakland, I'm going to head straight for dim sum. this has me so unbelievably excited...! Oh, you've given me a reason to go to Schenectady. Jealous of Schenectady right now. Oooooh, and here I just went up that way to go Blue Ribbon and to get my Mac n Cheese fix! Yeah for tortas and horchata! I love the radishes that come with all the tacos here in California- never saw it at any of the awesome taquerias in Chicago. If it's any consolation, I've had a lot of disappointing carne and al pastor out here too. I can not wait to go there!!!!! Thanks Daniel B & AoA gang! I lived in Venice Beach, CA for a handful of years (6) and I need me some good Mexican food.... Nom Nom! Have you tried the tacos at the Mexican market on Central right near N Allen? They're 3 for $6 and they have carnitas, carne asada, lengua, pollo, chorizo and I think another kind of sausage. They have a full menu of other nice dishes, too. And a breakfast menu! And freshly made salsas. I had the chili relleno and it was fantastic. Tell me more about the market itself. Does this mean that I no longer have to drive to Newburgh to buy cheese, crema, masa harina, and authentic Mexican imports? @Amy - I have tried the tacos at the Mexican market on Central in Albany. They are the real thing, but just not as good as I had hoped. La Mexicana's are significantly better. Although I never did get around to the chili relleno in Albany. @mary - The market is at least twice as large as the Mexican market in Albany, Amy was talking about above. But you haven't needed to drive to Newburgh for awhile. Poughkeepsie has had a vibrant Mexican community for years. And even Price Chopper and ShopRite now stock a bunch of classic Mexican ingredients. Time to drive out the Schenectady. 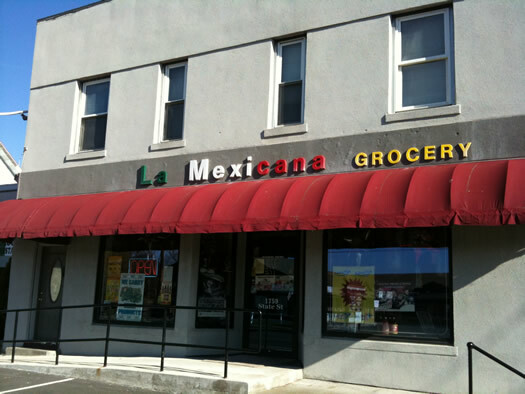 La Mexicana Market is open seven days: 9am - 8pm. You don't even need to go to Poughkeepsie Mary. There's a great little blink-and-you'll-miss-it place on Morton Street in Albany called La Marqueta/Frank & Giovanni's that has all of that stuff. As long as we are keeping running tabs on this place, I just got the burrito for the first time earlier today. It was equally solid. While the menu doesn't list a carnitas burrito, they will happily make you one. Just note two important words: sin lechuga. For some mysterious reason the burrito defaults to including lettuce. The lettuce itself is fine, but lettuce in a burrito is just wrong. One last note. The strength of this burrito doesn't bode well for the new Chipotle opening around the corner. And this is coming from a guy who loves Chipotle. So thrilled! Can't wait to check it out manana! @Daniel. B, I designed the menu at Bros. Tacos and am sorry that your past experience wasn't up to par. The tortilla recipe was tweaked recently and I believe it's an improvement. We make our tortillas about five times a day so at least you know your getting a fresh product, we also now have flour tortillas as an option if you dislike our corn tortillas. I also will have a new menu coming out in January that will have some new items. Expect pork and vegetarian tamales, made to order empanadas, enchiladas, burrito bowls and carnitas. The carnitas are cooked the traditional way only in lard with a few peppercorns and a few allspice berries. I hope you can make it in to give us another try. Traditional carnitas are very exciting. I'm looking forward to making a trip back to Bros once these are on the menu. We just moved here from Austin, TX and I am so glad to know I can get some good Mexican food. Also happy to see this blog. I'll consult it regularly!